Contents: Rotini with meat sauce, salad with ranch dressing, snicker doodle cookie, yogurt with fruit, low fat milk, french bread with garlic butter. WOW! I have paid big bucks for food that looks like this - this looks amazing -- someone please tell me where this is...seriously. GEEZ! 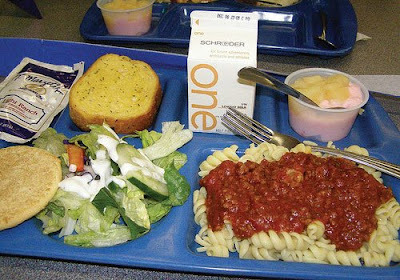 WHY DIDNT WE GET SERVED THIS AT MY SCHOOL?